I used to LOVE to watch the opening sequence to Mr. Rogers’ Neighborhood. Each episode showed Mr. Rogers walk into his home and get comfy by changing into his sweater and sneakers. Mr. Rogers invited viewers into a personal relationship with him and provided a safe space to discuss life and childhood. A significant part of the show’s opening included Mr. Rogers singing a song that invited viewers to be his neighbor. Who or what is a neighbor? Well that depends somewhat on your definition doesn’t it? The family who lives across the street from my home in Concord is most definitely my neighbors. They have a key to my house. We’ve watched pets during vacations, met each other’s kids at the bus stop, leant and borrowed tools and ingredients, traded stories, shared joys, and carpooled to endless school events. Luke 10: 25-37 is the passage most people refer to as the parable of the Good Samaritan but the question that led to the story was, “Who is my neighbor?” Jesus answered the question by telling of a man who was set upon by robbers and beaten badly. Two respected members of society ignored the man’s needs but the third passer-by, a Samaritan, helped. The Samaritan tended to the man’s immediate wounds, took him to an inn to rest and recuperate, and paid the innkeeper to continue care. Jesus asked, “Who was the neighbor?” and then told the questioner to, “Go and do likewise.” The story makes it clear WE are to be active helpers to our fellow man. Our role of helper is a fluid one because each person’s needs are unique AND because each Samaritan’s abilities are different too. on Coni Bennett’s future home. Joey Logano, a very successful NASCAR Sprint Cup Series Driver, worked alongside his enthusiastic team. Joey hammered nails, raised walls, and teased to keep spirits high. He and his group were being very good helpers that day. But like the Samaritan - Joey Logano did more. Joey asked Site Supervisor Bob (the Builder) LaMarche for more information about Habitat Cabarrus. Bob mentioned casually that Habitat Cabarrus had outgrown its trailer and that it was becoming unsafe to keep using it. A few weeks later the Joey Logano Foundation contacted Habitat Cabarrus and asked how to go about replacing that trailer. And then they replaced it. Just like that. I don’t know if the Joey Logano Foundation understands the positive impact their gift will have on Habitat Cabarrus and our ability to help build community - but it’s terrific. 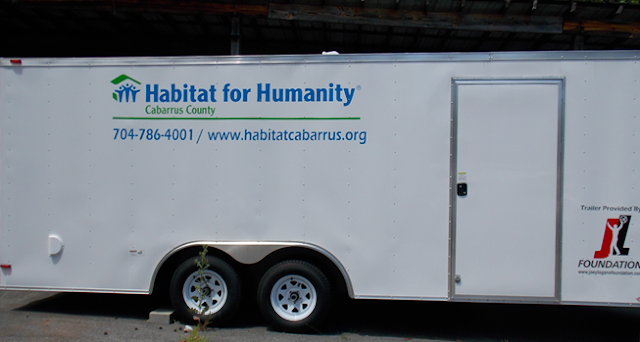 The Habitat Cabarrus trailer is a mobile construction unit and shifts nails, screws, gloves, hammers, and other building implements to the job site each work day. It’s a workhorse that performs in heat, cold, sun, and rain for years. Sometimes materials (like windows) break or need to be resized. Previously one of our Weekday Warriors would utilize his personal vehicle to transport trade-out materials to and from the supply store because the old trailer was too small to hold both supplies and large materials. Now the materials and tools fit in the trailer. This will not only be safer but will increase efficiency to Habitat Cabarrus construction activities. 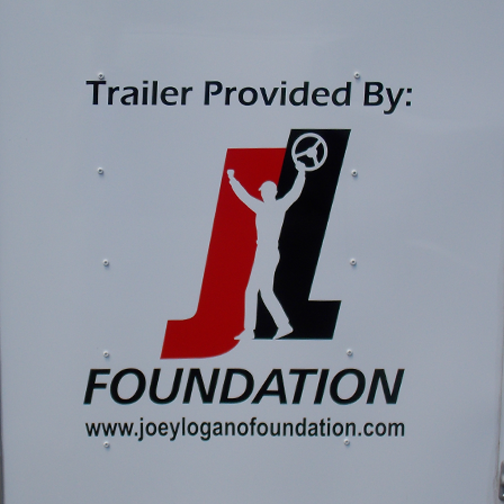 If you read this Joey Logano, a few of our Weekday Warriors would like to offer a few specific thank you’s for your foundation’s gift. Paul Meyer is grateful because the new trailer will permit greater organization and efficiency. Brad Fisher is excited because your gift will make it easier to get started each day. Paul Jordan says the larger size will enable volunteers and Warriors to actually SEE the materials they need. Jim Rockel is thankful for the increased safety the trailer provides. 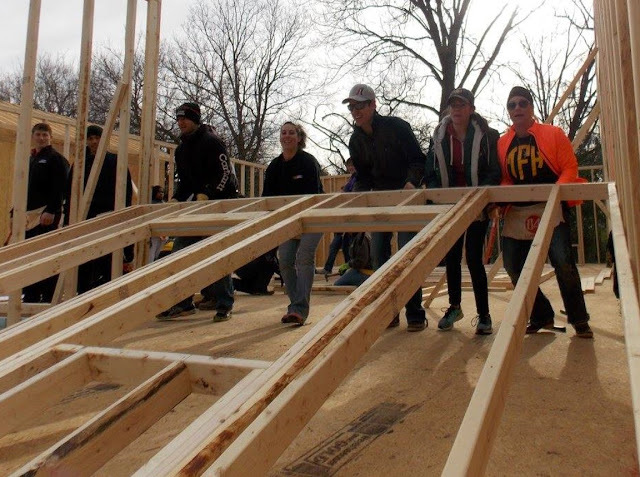 That rolling metal cube is a beautiful blessing to us, the Weekday Warriors and the volunteers who give their time and talents to help our partner families attain home ownership. That trailer is a visible reminder to our partner families that a community of neighbors (including a successful NASCAR Sprint Cup Series Driver) cares about their success. Sometimes a neighbor helps you up off the ground and bandages your wounds. Other neighbors help by collecting the mail when you’re out-of-town. Sometimes a neighbor’s help is the key to a trailer. Thank you to ALL our helpers who give time, talents, and treasures to build families and community. How awesome is that! What a difference the new trailer makes...its HUGE! I swear you could put the old trailer inside this one. It will make such an impact on the job site every single day. Thank you Joey Logano! Go Habitat Cabarrus! !